I am a visual artist living and working in New Orleans, LA and Martha's Vineyard, MA. The ancient Celts described the windswept, Irish moors as “thin places.” It was in these places they believed that the distance between the physical and spiritual world became shorter. These places were not for relaxation or comfort, but rather for finding meaning and reflection. In my work, I try to capture the thin places in my own life. My interest is in the abstract and emotive qualities of the sky and how they work in conjuncture with the overall tone of my work. While some subjects lend themselves to artists to paint what they see, the landscape allows me to paint what I am in. This can be both a physical or emotional space, and through the process of painting, my own internal landscape is conveyed. I show this through my mark making and paint application process. I like the physical paint in my work to have a modeling that echoes the mood in the image itself. My subject allows me to feel small in this world, by letting me put myself in the vast spaces that I create. It is only through painting the enormity of what surrounds me, that I can feel and reconcile its weight. Sarah Nelson is a visual artist living and working in Martha’s Vineyard, MA and New Orleans, LA. Though a born and raised islander, Nelson relocated to New Orleans in 2012 part time, after graduating from the University of New Hampshire with a BFA in Painting and Printmaking. Her recent work focuses on the abstract and emotive qualities of the sky and how the visual quality of atmosphere works in conjuncture with her imagery. In her recent Engrained series of paintings, she has developed a body of work, which combines the physical grain of wood panel surfaces with the composition of her images. Her work has gained recent recognition through her current participation in the Louisiana Contemporary exhibit at the Ogden Museum of Southern Art. 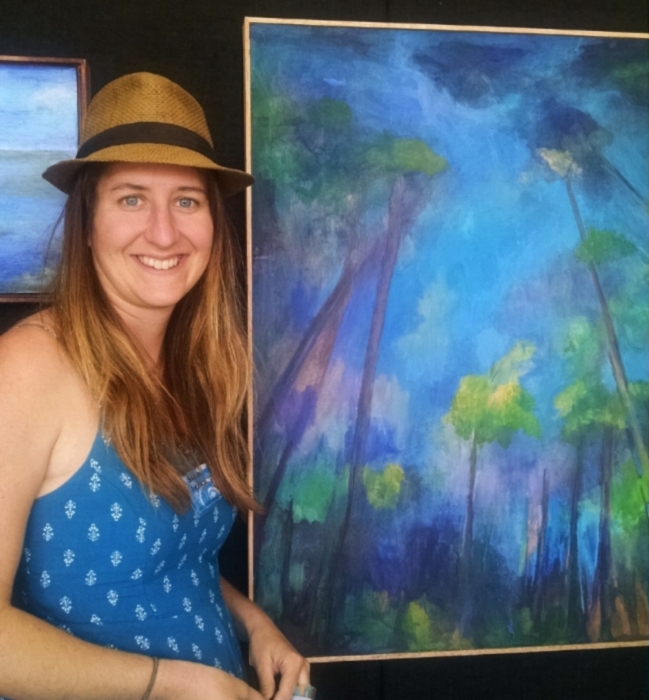 She regularly participates in the New Orleans Jazz and Heritage Festival, Contemporary Crafts Exhibition and was a regional semifinalist the Bombay Sapphire Artisan Series. Nelson also displayed her paintings last summer in the Louisiana State Museum’s Art Melt exhibition, a juried exhibition honoring contemporary artists at the state capitol center in Baton Rouge. Her work is shown in galleries, private residences, and public collections throughout the nation. recently gaining a permanent display at the new Louisiana State University Hospital.